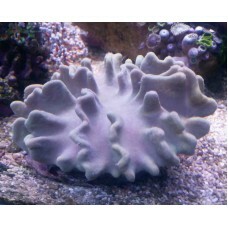 Lobophytum Leather Corals are very similar in make and appearance to Sarcophyton Leather Corals. The Rabbit Ear Leather takes on interesting shapes and is easily propagated into smaller colonies. The Rabbit Ear Leather is often and easily confused with Devil’s Hand Leather and Crown Leather, but this leather coral has long, lobed “ears” that give it its name. This coral is fairly easy to care for and is an excellent coral for beginners as well as a low maintenance coral for experts.